This is a very niche product for a niche crowd, but it will transform the way you view the DX7 and if you're an FM nut, it'll take your beloved synth to the next level. Seriously expands on the 32 presets of the DX7. Great FM tones. Price. No MIDI Thru. Cycling through patches. Yamaha's DX7 is famous not only for its FM tones but for its complex programming. Its buttons and single-slider system drove most of us to presets. 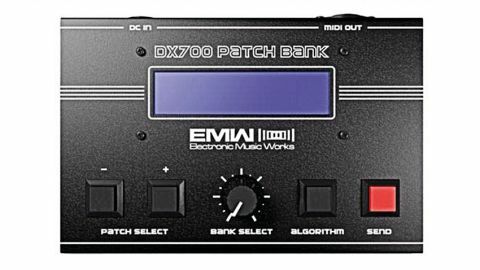 Brazilian synth company Electronic Music Works (EMW) have taken the preset premise and ran with it with the DX700, a hardware box containing 700 SysEx patches for the DX7. "Having 700 patches available at a button's notice changes the DX into quite a powerful machine"
We're well aware there are hundreds of patches available online for free, but the DX can only store 32 at a time on its internal memory so having 700 at a button's notice changes the DX into quite a powerful machine. Turning the single dial scrolls through categories like Bass, Lead, Organ, Synth Pop, Layered and Effects that cover pretty much every sound you could imagine - and some you couldn't. There are some cheeky patch names like 'T. Heads' and '1999' and although the 'Analogue' section might be a bit ambitious, you'll quickly remember why the DX7 was so revered. Before you pay the relatively high price for this niche box, there are a few caveats. "If you want to sequence any of the 700's sounds, you'll either need to constantly swap MIDI cables or buy a MIDI Merge box"
You can't overwrite patches with any editing you've done, you have to dial through each of the 35 presets per bank one at a time on a two-line screen and, worst of all, with only one MIDI In on the DX7, you can't have the DX700 and a sequencer plugged in at the same time. If you want to sequence any of the 700's sounds, you'll either need to constantly swap MIDI cables or buy a MIDI Merge box - funnily enough EMW sell one for $79. Why there isn't a MIDI Thru on the box is beyond us. You could probably pick up an actual DX7 for the same price, so how much you value the DX700 is up to you. There are iOS apps that do something similar with SysEx so it's worth investigating those before paying out.